Jenny Matlock: In late spring the box would arrive. In late spring the box would arrive. Its small size would give no indication of what was inside. It held a potential rainbow of autumn colored blossoms and school clothes for my three small children. Inside the thick, protective cardboard was my yearly order for mum slips. Tiny little sprigs of plants that held the promise of apricot bronze, crimson red, and harvest gold blossoms. In the dark days of late winter I would have pored over the catalogs for hours. I never knew how I managed to place an order for only 200 tiny plants from the romantic selection of offerings with names like Autumn Fire, Yellow Moon, Burnt Copper and Rosy Glow. The agony of these decisions resulted in page after page of crossed out or exclamation-pointed candidates. Finally, finally I would narrow the list down until the 20 ultimate choices were made. 10 slips of 20 varieties. 200 plants. Into the mail the order would go and while I waited I would harvest tiny, tender offerings of asparagus and peas and lettuce and watch the buds start to swell on the apple trees. The loamy black soil in the large gardens would be plowed and rototilled. Until finally the box would arrive. I would drag it up onto the warmth of the covered porch and cut it open carefully and anxiously. Tenderly I would touch the little shoots that would become school clothes and shoes and new winter coats and mittens. The smell of dirt and promise and the fragrance of chrysanthemum would fill the small porch and I would anxiously sort the small bundles of slips according to a pencilled planting grid I’d made based on height and diameter. And then I would be ready to begin. The beat-up old wheelbarrow would be rescued from the tall weeds behind the garage. It held the box perfectly and I would wheel it to the smoke house where I stored my garden tools. Opening the door of that small stone structure would always surprise me with the fragrance of decades of cured bacon and ham. The tantalizing smell was always a distraction to the task at hand, but I did my best to ignore it. Kids were at school and the day didn’t hold enough time for a second breakfast break. 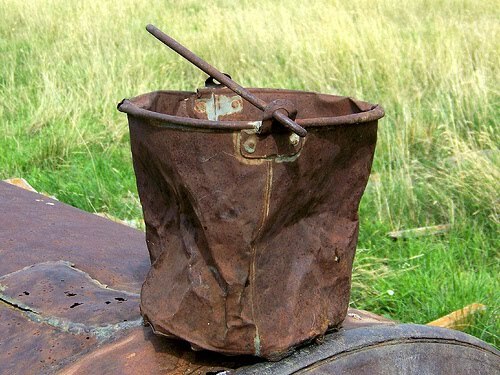 Into an old metal bucket I would throw my favorite garden trowel, a yardstick from some defunct hardware store, and a scratchy ball of twine. A beat-up hammer, paint covered scissors and rough wooden stakes went into the bucket next joined finally by an old chipped white enamelware saucepan. Reluctantly I would close the smokehouse door and not allow myself to imagine the stories contained in the hand-hewn beams of the old building. Today was planting day. Daydreaming was not allowed. The bucket would join the box in the wheelbarrow and in the gentle, late spring sunshine I would trundle my treasures down the hill to the little field where I planted my mums each year. On a small slope, surrounded by ancient lilac bushes on one side and gnarled apple trees on the other was where the real work would begin. At the bottom of the small slope was a fresh-water spring. In planting and in drought, I carried buckets from that bubbling water source to my thirsty plants. When I became tired from the carrying, I drank my fill from the blue and white speckled metal mug always left hanging on a stubby branch of one of the apple trees. The water was so clear and pure it took my breath away. Dumping out my little pile of tools onto the tender emerald grass, I would grab the now empty bucket and fill it at the spring. The water was so cold that the splash of it on my jeans and tennis shoes always made me gasp. The heavy bucket would be placed at the edge of the carefully worked garden. Next, I would hammer splintery wooden stakes into the end of each row…forty stakes...twenty rows…each measured out on the yardstick. The stakes would sink easily into the cultivated soil. The ball of twine would arc through the air as I threw it from stake to stake. Tie, tighten, cut, toss. Tie, tighten, cut, toss. Finally the little mum field would be finished...stripes of twine marking out little territories for each variety of plant. I would scrounge the crumbled up planting diagram from my pocket and anchor it to the grass with a rock. My penciled marks would be a bit smudged and hard to decipher, but finally I would triumpantly translate them. Reading the small white tags on each bundle of tiny sprouts, I would finally have them sorted and placed at the end of each row. My hands would scoop a bit of soft soil over the roots to keep them from drying out, and then I would begin digging the holes. When the tenth hole was dug in each row, I would fill the little chipped up saucepan from the larger bucket of water and then pour water into each indentation. When the water finally drained away, I would pour more water in and wait for it to dissipate a second time. My Grandmother taught me to plant like this, and to this day I always follow her careful instructions. Finally, all the little mum slips would be planted in the damp holes with the dirt gently gathered and tamped around each small stem. Plant, gather, tamp…plant, gather, tamp. When the row was completely done, each plant would receive another drink poured gently over the soil. The afternoon would slip away... hauling water, digging holes, planting and tamping. Back muscles would grow sore, jeans would become wet and muddy until finally, finally the 200th mum was planted. I would staighten up wearily to admire my little newly planted field. I knew that a summer of weeding and mulching, pinching buds and carrying water stretched ahead of me. I recognized quite clearly that an autumn of digging and potting and hanging my little hand-lettered sign at the end of the driveway – Mums for Sale – was still to come. And beyond that, taking all the hard earned money to replace clothes worn out and outgrown and to fill the very long list of needed school supplies. But for that day, looking at my handiwork, I was content. Sometimes the world today does not feel nearly as content to me. Things often seem very difficult for so many. My heart hurts to see families struggle to feed and clothe their children…people fight to keep a roof over their head and to hang onto hope as they lose their jobs and their sense of security. How lucky I was to raise my children in a time and place when planting mums was the answer to some of my financial prayers. How fortunate I was that the glowing gifts of autumn’s bounty helped me to provide for my children. I don’t know if there is still a place in the world today for little hand lettered signs with ‘Mums for Sale’ written on them. Truly. Wish. Upon. An. Autumn. Star. Hope. And if my wish comes true and I see one, I will stop and rejoice. 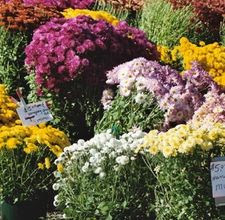 And buy a trunkful of glowing chrysanthemums. And I will send one to you so you can feel the hope, too. That was awesome! Pure inspiration. Thanks! It's a beautiful and inspiring story. I sort of wish I had a smokehouse. My hand-painted sign would say "bacon for sale". Beautiful words from a beautiful lady. Girl, you pulled me right there beside ya though your very picturesque story!!! I know...I've had the same feelin's about life gone by. It was just simpler, we had more time to do thing like plant a field of flowers. While feedin' only four of the eight grandkiddo durin' Camp Grandma I was yanked under the table at the food these 'littles' can devour. Cinnamon toast took a whole loaf of bread in the mornin'. The eldest told me, "we rarely get toast 'cause it takes a loaf of bread. I made a triple batch of pancakes and they were bargainin' over the last one. "Mama makes 'Truck Stop Pancakes", Joel told me. I just thought it was the name of a recipe but nooooo, I WAS actually a truck stop pancake recipe that made 60 large pancakes. I don't know how our children are feedin' their young. I'm simply amazed. I learned from my grandfather. In the fall, he'd hang his hand-lettered sign, "Dahlia Bulbs For Sale," and pass the time with the regulars who waited eagerly for that sign each year. Lovely write, Jenny. Brought back such fond memories of days before these. What a beautiful way to satisfy practical needs. I will be looking for "Mums for Sale" signs now. My grandfather had an artesian spring on his farm. He was so proud of that water! He kept a ladle hanging on a nail in a tree by the spring so people who came to visit could taste that water! That gave me shivers. The anticipations, the hope, the faith are all so tangible in this beautiful story. Thank you for such a beautiful beginning to my day! I was a "Burbs" girl growing up, so there wasn't a lot of room in our postage stamp backyard. However, I do know a bit about roses from my mom. She loved them and cared for them just as she did us. Thanks for a nice walk down memory lane when times really were easier! There definitely is a place in the world for such a sign Jenny. Here where I live we have all kinds a little stands at the end of driveways that sell a myriad of things from eggs to vegetables to flowers and one day I will be one of them that has such a sign! When I do I hope you will "pop" by for a bunch!! Many of the farms around here have signs out selling eggs or potatoes or home grown veggies, but I've never seen one advertising chrysanthemums. Oh boy! This one carried me away, Jenny. Her blog is one of my favorites! And she is the very best kind of nostalgia brought to life. That was terrific. I could smell the black loamy soil...there's nothing like it. Clearly you've lived somewhere other than AZ or you have the most vivid (and correct) imagination. Loved this! I was never much of a planter, or grower, except for my babies... which kept me quite busy. Thankfully, except for a 10 month period of (very difficult) time, my husband was able to provide the basic necessities and never had to count on me bringing in extra money to help out. We might have starved, if that was the case. How lucky you were to be able to find a way to contribute to your family finances. It was a lot of hard work, but it helped, and filled your yard full of beauty. You are wonderful, Jenny. Thank you! Your words are alive and inspiring! I will assume you've taken the time to put these into a book! You are talented. Thank you for sharing about your earlier years of motherhood. Sundays with Steve - Cooking to Win!